Real gross domestic product (GDP) was up 0.5% in May, after increasing 0.1% in April. The rise was widespread as 19 of 20 industrial sectors registered increases. The output of goods-producing industries rose 0.6%, led by gains in mining, quarrying, and oil and gas extraction. 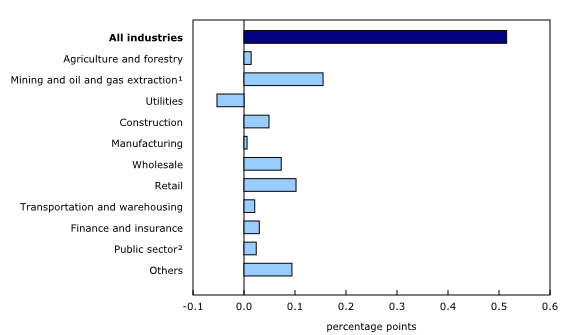 Services-producing industries rose 0.5% as all sectors increased. The mining, quarrying, and oil and gas extraction sector was up for the fourth month in a row in May, growing by 1.8%. The oil and gas extraction sub-sector rose 2.5% in May, a sixth increase in seven months. Non-conventional oil was up 5.3% as crude bitumen extraction in Alberta increased following maintenance and capacity-expansion-related shutdowns at some facilities in April. Conventional oil and gas extraction was unchanged as growth in crude oil extraction was offset by a decline in natural gas extraction. Mining excluding oil and gas extraction was up 0.6%. Metal ore mining increased 4.5%, in part due to a 7.1% rise at copper, nickel, lead and zinc mines, the first gain after eight months of declines. Non-metallic mineral mining contracted 4.1% due to lower output at diamond mines. Coal mining was up 1.6%. Following four months of growth, support activities for mining and oil and gas extraction were down 2.2% in May on account of lower activity by drilling and rigging services. Industries affected by unusual weather conditions in April, including colder-than-normal temperatures across the country and an ice storm across Central and Eastern Canada, mostly had offsetting changes in May. 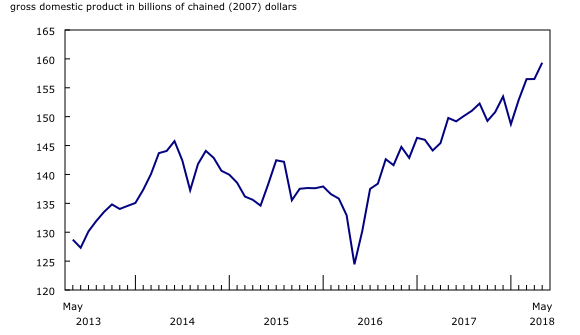 After a 1.0% decline in April, retail trade rose 2.0% in May, the largest increase since October 2017. There were notable increases in activity at motor vehicle and parts dealers and in store types associated with springtime activities such as building material and garden equipment and supplies dealers, clothing and clothing accessories stores and general merchandise stores. Construction increased 0.7% in May, essentially compensating for April's decline. Residential building construction (+1.3%) and repair construction (+1.5%) were both up after decreases in April. Non-residential building construction declined 0.5% after posting gains for the six previous months. Following 1.4% growth in April to meet increased demand for heating due to colder-than-usual temperatures, the utilities sector contracted 2.4% as warmer and spring-like weather conditions returned across the country. Electric power generation, transmission and distribution contracted 3.0%, while natural gas distribution edged up 0.1%. The food services and drinking places sub-sector was up 0.9%, after a 1.1% decline in April. Wholesale trade was up 1.4% in May. The largest increase in terms of output came from building material and supplies wholesaling (+4.4%) as there was increased demand for lumber and millwork products. Miscellaneous wholesaling rose 5.0%, mainly from higher sales of agricultural supplies. Motor vehicle and parts wholesaling (-1.0%) was down for a second consecutive month as both imports and exports of motor vehicles decreased. 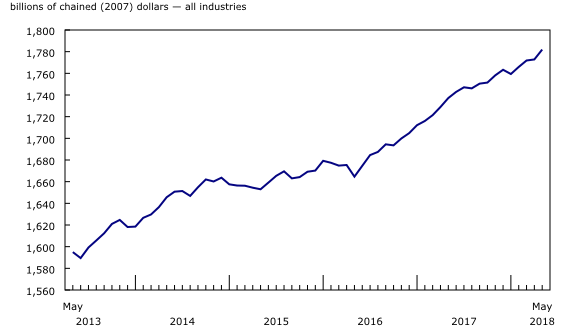 The manufacturing sector edged up 0.1% in May, following a 0.8% increase in April when the real inventory-to-sales ratio was the highest since August 2009. Non-durable manufacturing rose 0.9% as six of nine subsectors grew. Chemical manufacturing was up 4.5% from higher output of manufacturers of pharmaceuticals and medicines and pesticides, fertilizers and other agricultural products. Petroleum and coal products declined 0.6% as shutdowns initiated in April at several refineries for maintenance and retooling work continued. Durable manufacturing declined 0.7% as its 10 subsectors were evenly split between increases and decreases. Transportation equipment (-2.5%) led the decline as five of seven industry groups contracted. Fabricated metal products decreased 4.8%, following three months of increases. Machinery manufacturing (+2.5%) had the largest increase in terms of output. Activity at the offices of real estate agents and brokers was down 2.7% in May, in part due to declining home sales in British Columbia. This was the fourth decline since the beginning of 2018. The professional, scientific and technical services sector rose 0.5% in May. Most industries recorded an increase, led by growth in computer systems design and related services (+1.5%). The finance and insurance sector grew 0.4%, led by a 0.6% increase in depository credit intermediation. Financial investment services (+0.4%) and insurance carriers and related activities (+0.2%) also increased. Transportation and warehousing services were up 0.4%, led by increases in truck (+0.6%) and rail (+1.2%) transportation. Pipeline transportation edged down 0.2% as natural gas transportation declined, while crude oil transportation rose. The public sector edged up 0.1%, as health care and social assistance rose 0.3%. Public administration and educational services were essentially unchanged. Monthly gross domestic product (GDP) by industry data at basic prices are chained volume estimates with 2007 as the reference year. This means that data for each industry and each aggregate are obtained from a chained volume index, multiplied by the industry's value added in 2007. Monthly data are benchmarked to annually chained Fisher volume indexes of GDP obtained from the constant-price supply and use tables (SUT) up to the latest SUT year (2014). For the period starting with January 2015, data are derived by chaining a fixed-weight Laspeyres volume index to the prior period. The fixed weights are 2014 industry prices. With this release of monthly GDP by industry, revisions have been made back to January 2017. Real-time table 36-10-0491 will be updated on August 20. Data on GDP by industry for June will be released on August 30.